Squanto (or Tisquantum, 1580? – November 1622) was a Native American who helped the Pilgrims survive in the New World. He learned to speak English and was hired as a guide and interpreter. He taught the Pilgrims to plant corn. 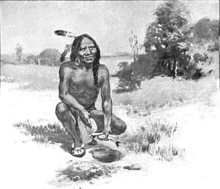 Squanto had much power among the Native Americans and the Pilgrims. He abused it, and barely escaped an Indian execution. He died in 1622 while making a trip around Cape Cod. Squanto was born about 1580 in the area of present day Plymouth, Massachusetts. He was a member of the Pawtucket people. Little is known about his early life. Squanto is thought to have been kidnapped as a young boy along the coast of Maine, and taken to England in 1605. He was taught English. He was hired as a guide and interpreter. He returned to his homeland with John Smith in 1614. In the spring of 1621, Squanto was taken to the Pilgrim settlement of Plymouth by Samoset. Samoset was an Indian who had made friends with the English settlers. Squanto was soon living with the people of Plymouth. He joined them in meeting with Indian tribes. He helped to keep the peace. Tradition says he taught the Pilgrims to catch eels. 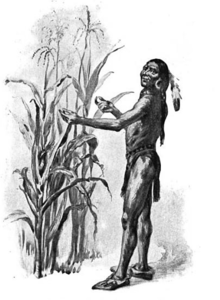 William Bradford wrote that Squanto was of great help in the first year's spring planting of corn. He showed the Pilgrims both how to plant it and how to tend it. He showed them how to use fish as a fertilizer. Squanto's power went to his head. He made some shady deals with both the Pilgrims and the Indians. He was found out, and barely escaped an Indian execution. In November 1622, Squanto fell ill with a fever while on a trip around Cape Cod with William Bradford. He may have been poisoned by the Wampanoag. He bled at the nose, and said it was a certain sign of death. He asked Bradford to pray to the Christian god so he might enter Heaven. He gave some gifts to others. He died a few days later in what is now Chatham, Massachusetts. ↑ Deroy Murdock (November 21, 2012). "Squanto, the Worldly Indian Who Dazzled the Pilgrims". National Review Online. This page was last changed on 13 March 2019, at 22:26.